The JsonTestCaseScriptRunner is a convenience provider for Json formatted integration tests to allow writing tests quicker without the need to setup or tear down specific data structures. The JSON format should make it also possible for novice user to understand what sort of tests are run as the content is based on wikitext rather than native PHP. 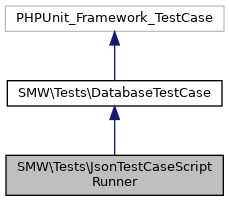 Normally returns TRUE but can act on the list retrieved from JsonTestCaseScriptRunner::getAllowedTestCaseFiles (or hereof) to filter selected files and help fine tune a setup or debug a potential issue without having to run all test files at once. Selected list of settings (internal or MediaWiki related) that are permissible for the time of the test run to be manipulated. For a configuration that requires special treatment (i.e. where a simple assignment isn't sufficient), a callback can be assigned to a settings key in order to sort out required manipulation (constants etc. ).